Welcome to the monthly e-bulletin of the South Asia Media Solidarity Network (SAMSN). The next bulletin will be sent on August 15, 2017, and your inputs are most welcome. The International Federation of Journalists (IFJ) and the South Asia Media Solidarity Network (SAMSN) while expressing serious concern over the growing trend of internet shutdowns in South Asia call on governments to stop internet shutdowns. Internet shutdown is an act against citizens’ freedom of expression and right to information; it greatly affects press freedom by restricting independent media’s capacity to report and disseminate news. 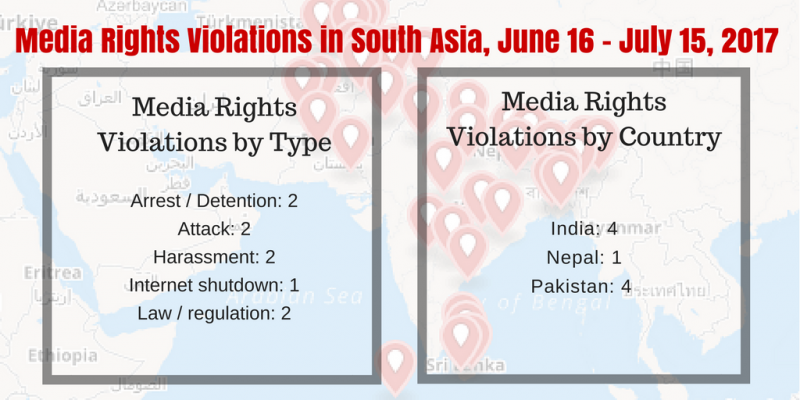 At the successful conclusion of the #JournosAgainstShutdowns: Campaign Against Internet Shutdowns in South Asia from May 29 to June 16, the IFJ and SAMSN called for greater vigilance in monitoring and documenting internet shutdowns by journalists, media and unions. The campaign was a first step in raising awareness about the impact of internet shutdowns as a freedom of expression and press freedom issue. A guide to monitoring shutdowns was released as part of the campaign. Read more here, and more information about the #JournosAgainstShutdowns campaign can be found here. On June 18, the West Bengal state government blocked all internet services in a bid to prevent mass gatherings as Darjeeling remained tense due to political protests by the Gorkha Janmukti Morcha (GJM) demanding a separate Gorkhaland. The ban came after a report that GJM leadership were using social media platforms to devise strategy and communication for the demonstrations. The ban was initially for 48 hours but the administration on June 20 decided to continue with the clampdown on the Internet for seven more days and extended the ban to local cable television channels for ‘preventing commission of offences’ in strife-torn Darjeeling. Read more. Editor Khem Bhandari and executive editor Ganesh Bhatt of Manaskhanda daily were arrested on June 17 for publication of a news report and charged under the Public Crime and Punishment Act in Bhimdatt Municipality, Kanchanpur, western Nepal. The news in question is a report about the police arrest of two females whom the newspaper claimed to be innocent. Police released Bhandari and Bhatt after 28 hours of detention on June 18 under pressure from an FNJ-led protest and demonstrations by local journalists. Read more. On June 19, ruling Bharatiya Janata Party (BJP) spokesperson Nupur Sharma filed a police complaint against journalist Rana Ayyub over a tweet that Sharma claimed to be ‘defamatory, hate-filled and derogatory’. Ayyub, the author of Gujarat Files: Anatomy of a Cover Up, a book about the 2002 Gujarat riots, that implicates BJP top leaders for the riots, had tweeted a comment on the presidential candidate by an alliance backed by BJP. The complaint stated that Ayyub’s tweet reflected ‘extremely casteist, hateful and disrespectful mindset’ against the scheduled castes or dalits, which the candidate represents. Read more. Zafarullah Achakzai, 21-year-old chief reporter of Qudrat daily, was arrested by the paramilitary Frontiers Corps under the Prevention of Electronic Crimes Act 2016 and handed over to the Federal Investigation Agency (FIA) in Quetta, Balochistan on June 25 for criticizing the FIA on social media. The journalist was produced in the court of the Judicial Magistrate, who remanded him for six days in custody. Read more. The Speaker of Karnataka legislative assembly K B Koliwad authorized the one-year imprisonment and a fine of Rs 10,000 (USD 200) of Ravi Belagere, editor of weekly tabloid Hai Bangalore, and Anil Raj, editor of a local tabloid Yelahanka Voice for publishing reports criticizing the members of legislative assembly (MLAs) on June 21. Belagere was punished for the article published in September 2014 about Koliwad’s attempt to get into state cabinet. Koliwad himself moved a motion on breach of privilege by the editor and had chaired the hearing as the chairman of the privileges committee. Raj, was punished on the basis of a motion by two other MLAs which the committee found to be defamatory. Read the IFJ statement here and National Union of Journalists (India) statement here. On June 21, six cameramen and reporters of different TV channels were injured when the security guards of the University of Agriculture, Faisalabad thrashed them. Yousaf Cheema of Samaa TV was covering news related to the expulsion of students for social media posts when the security guards snatched the camera, thrashed the crew and damaged their vehicle. Journalists from NewsOne, Dunya News, Channel 24, and ARY TV channels reached at the site when they were informed about the incident. The university’s security guards assaulted them as well. In another incident on June 20, students of the Madressah Haqqania beat up Din News employees and broke their camera. The TV channel staff claimed that they were reporting on alleged electricity theft by the management. During the incident, cameraman Rashid Azeem was beaten badly. Read more. Abdullah Zafar, a staff reporter at The Nation daily, was taken away by over a dozen men in plainclothes who raided his family house at Sacchal in Karachi on July 9. Zafarullah, the father of the missing journalist, said that the men arrived in three vehicles accompanied by two police vans. “Over a dozen personnel in plainclothes arrived at my home at late night,” he told The Nation. “After entering our home, they went to my son’s room and after a two-minute talk with him, they took him away.” The police, paramilitary force and counter-terrorism department have all denied carrying out the raid or detaining the journalist. Zafarullah returned after a day. Read more. 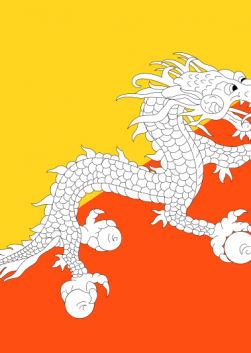 A contentious situation has arisen in Sri Lanka over the draft Act on Independent Council for News Media Standards, where the name of the Free Media Movement (FMM) is also being brought up in the debates. The FMM sought to make its position clear regarding some of the issues under discussion. Read more. Following the June 19 verdict of the Supreme Court on certain issues arising out of implementation of the Majithia wage boards for the newspaper/ news agency establishments, National Union of Journalists (India) NUJ(I) and its state units welcomed the clarification by the two member bench of the Supreme Court on several controversies raised by the newspaper and news agency managements to thwart the full and proper implementation of the Majithia Wage Boards’ recommendation on wage scales in the newspaper industry. Read more. The Supreme Court of India on June 19, 2017, delivered a verdict in a long-pending case concerning journalists and non-journalist employees of newspapers on the implementation of the Majithia Wage Board. While interpretations of the order by the bench headed by Justice Ranjan Gogoi vary, here we present a review of the verdict by veteran journalist R Rajendra Prabhu, prepared for the National Union of Journalists (India). Read more. As part of the Campaign Against Internet Shutdowns in South Asia, journalists from five countries in South Asia speak about how internet shutdowns affect freedom of expression and discuss what can be done to counter the phenomenon. Participants were Participants: Ujjwal Acharya (Nepal); Apar Gupta (India), lawyer and volunteer trustee at the Internet Freedom Foundation; Laxmi Murthy (India); journalist and IFJ consultant; Nadia Sharmeen (Bangladesh), Ekkator TV; Lubna Jerar Naqvi (Pakistan) Geo TV’s social media head and secretary of the Karachi Union of Journalists. For edited video of the Google hangout and transcribe, click here. Bangladesh law enforcement authorities have illegally detained hundreds of people since 2013, including scores of opposition activists, and held them in secret detention, Human Rights Watch said in a report released today. The Bangladesh government should immediately stop this widespread practice of enforced disappearances, order prompt, impartial, and independent investigations into these allegations, provide answers to families, and prosecute security forces responsible for such egregious rights violations. Read more. A new ILO report, World Employment and Social Outlook (WESO): Trends for Women 2017, shows gender gaps are one of the most pressing challenges facing the world of work. Women are significantly less likely than men to participate in the labour market, and those who do look for work are less likely than men to find it. What’s more, women in the region work in jobs that tend to be both of lower quality and lower pay than their male counterparts. Read more. Several citizen-journalism initiatives have sprung up to combat fake news, but they face an uphill battle. The stories ricochet through echo chambers on Facebook, Twitter and the WhatsApp mobile messaging platform, which has more than 200 million users in India, and find a receptive audience on mainstream news channels that increasingly back the government. Read more. 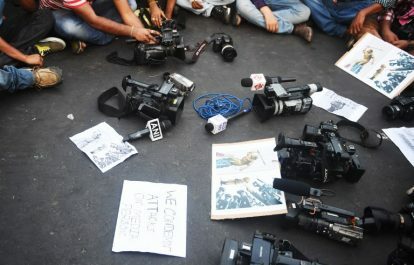 India has emerged as one of the worst places for working journalists, where they are attacked and justice is rarely delivered to their bereaved families. 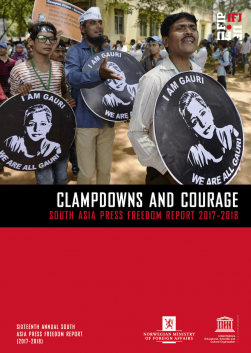 The Indian subcontinent as a whole today stands on the cusp of being a danger zone for journalists, as the region witnessed the murder of over 10 journalists in the first half of 2017. 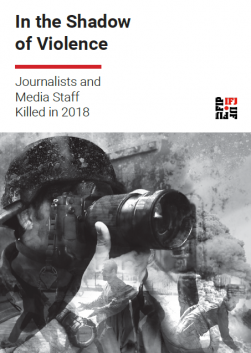 India and Pakistan headed the list with seven of the professional journalists killed in the last six months; with Bangladesh, Myanmar and Maldives adding one casualty each. Read more. The government in power, co-headed by Premier Ranil Wickremesinghe from the UNP and President Maithripala Sirisena from the SLFP, are planning to replace the draconian Press Council Law of 1973, with a new law, which is equally draconian, if not worse. Some of the harsh penalties proposed under the law are a fine of rupees one million to any media institution which does not subscribe to the proposed law and a fine of Rs 100,000 on and imprisonment of a journalist publishing false news. Read more. Afghanistan’s President Ashraf Ghani has signed into law a cybercrime bill targeting online crime and militancy by groups such as the Taliban and Islamic State amid concerns it could limit free speech. The Cyber Crime Law criminalizes a range of online activities including hacking, spreading ethnic hatred, distribution of online defamatory speech, exposing government secrets, and cyber-terrorism within the provisions of the newly reviewed penal code. Read more. Though the current secular government in Bangladesh speaks positively about press freedom in the country, the recent reality suggests things are not so rosy for journalists there. A controversial section of the country’s ICT Act has seen an increasing number of journalists arrested. Read more.